SAN FRANCISCO, CA--(Marketwired - September 22, 2016) - McGuire Real Estate is pleased to announce its recent integration of DocuSign Transaction Rooms for Real Estate, the real estate focused solution from the global eSignature and Digital Transaction Management (DTM) leader, that's now available to every McGuire agent and every McGuire client. DocuSign has changed the way the real estate community does business. First, DocuSign eSignatures sped up the transaction process and enabled brokers and agents to easily transact with clients around the globe. 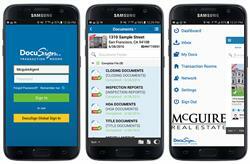 And now, DocuSign Transaction Rooms allow McGuire's agents and clients to easily manage, organize, share, and eSign documents wherever they are because they have access to this simple, mobile, and secure solution for managing real estate transactions 100% digitally from listing to close. With DocuSign Transaction Rooms for Real Estate, whether it's guiding clients through the sale of their first home, locating an investment property, or helping them buy their new dream home, McGuire's agents are now better prepared to eliminate the unexpected hassles that often delay a deal from getting done. Agents can create a virtual workspace for their buyer or seller that brings together each party within a secure place to store and share documents, send and sign offers. It also provides reliable and timely notifications to all parties to the transaction included in the room so that all deadlines and schedules are met on time. This flexible solution allows clients to work directly with their McGuire agent in a number of ways, while also strengthening the agent's ability to easily communicate with McGuire staff, management, and preferred vendors. The result is agents who have more time, energy, and focus on getting the job done to exceed their clients' expectations. "In serving the Bay Area's niche markets for nearly 100 years, our brokers, agents and clients expect the absolute best experience when it comes to managing and closing real estate transactions," said Alex Buehlmann, COO of McGuire Real Estate. "We want our agents to have complete control over their transactions and our clients to have total visibility for every step of the way. DocuSign helps us provide the best-in-class service that's expected of McGuire, no matter the time or place." With more than 2.5 million real estate transactions completed via DocuSign annually, McGuire is proud to be a part of the company's Broker Enterprise Platform, leading the industry as the open and trusted platform of choice. The complete integration of DocuSign Transaction Rooms for Real Estate strengthens McGuire's ability to continually deliver unprecedented time-savings and valuable transaction solutions to agents and clients -- anytime, anywhere, on any device. McGuire takes a non-traditional and highly-personalized approach to furthering the success of its sales team. This creative and strategic approach to doing business is what allows McGuire to provide exceptional support that reaches beyond traditional real estate and delivers forward-thinking solutions for its agents and clientele. As a local, luxury boutique that focuses on the San Francisco Bay Area's high-end niche markets, McGuire Real Estate is a privately held corporation that was founded in 1919. We are headquartered in San Francisco's Marina District with additional offices in Noe Valley and South Park -- as well as in Marin County, the East Bay, and Mid-Peninsula. McGuire is the exclusive international associate of Savills PLC, headquartered in London, and is a broker member of Luxury Portfolio® International, Leading Real Estate Companies of the World®, and The Enterprise Network. Our luxury, global, and industry affiliations allow us to connect our agents and clients to a world-wide marketplace with exclusive opportunities. 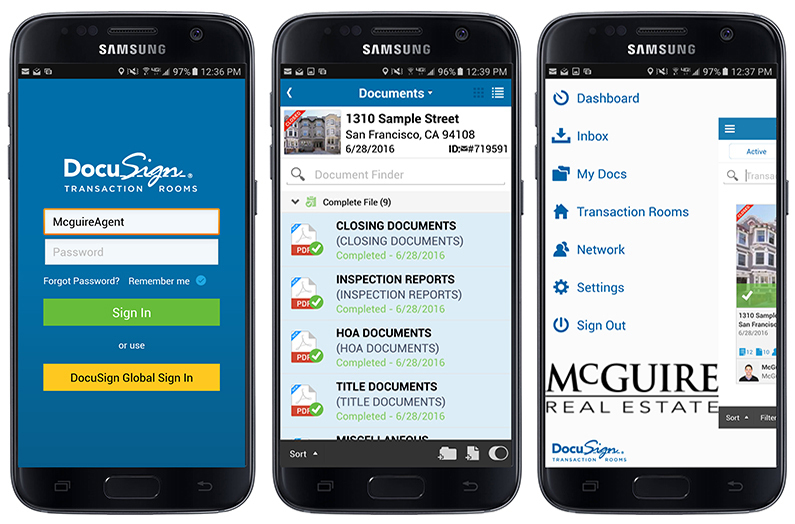 DocuSign provides all McGuire Real Estate agents and clients with a simple, mobile, and secure solution for real estate transactions.